Vélo Vogue: The Spinster Rides to Success! We've met our minimum goal, but The Spinster campaign is not over yet, so let's make the MOST of the next few days. We are aiming to meet our second goal - DVD production before the holidays. Let's keep on riding towards success and hit the $10,000 mark before Sunday morning. 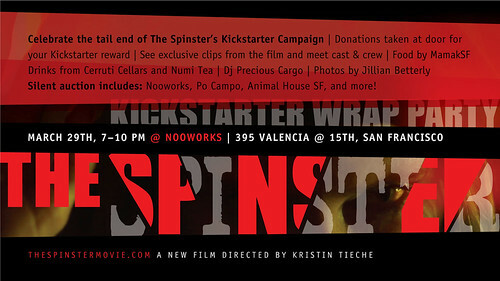 Please come one and all and celebrate with us at our Kickstarter Wrap Party on Friday 3/29 at Nooworks! Silent Auction includes Nooworks, Po Campo, Hotel Carlton, Animal House SF and more! Try on some clothes, eat, drink and be merry and support independent, local, bicycle film! Invite friends and keep sharing The Spinster! See you there! Ding Ding!